After starting his master’s as an undergraduate, a Brandeis University alumnus proves that full-time work and graduate school can co-exist. Three days after graduating from Brandeis University with a BS in Health: Science, Society, and Policy (HSSP) and a minor in Economics, Allan Chuang (class of 2017) enrolled in the university’s Health and Medical Informatics (HMI) program — a master’s of science degree offered through the university’s division of Graduate Professional Studies. 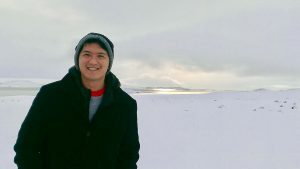 Brandeis GPS caught up with Allan to learn more about his new life as a part-time graduate student and what motivated him to continue his Brandeis education. The first time Allan Chuang learned of Brandeis GPS was through an email sent by the university’s registrar during the first or second week of his senior year. After reading that graduating seniors could enroll in GPS’s online graduate courses, he began researching programs and discovered that the HMI program and Brandeis GPS offered courses that would expand his current access to health policy education. “I found that HMI is very similar to HSSP and since GPS was offering the program’s intro course, I just decided to give it a shot,” said Chuang. This past spring, Chuang enrolled in Perspectives on Health/Medical Information Systems. Despite taking four other courses during this last undergraduate semester, he found the workload manageable and enjoyed the flexibility of online learning. In addition to setting aside blocks of study time and finding new coffee shops to work from, he also stressed how discipline and self-motivation were critical to his academic success. After graduating from Brandeis last May, Chuang accepted a position at a travel tech start-up in Taiwan. Despite working 50-60 hours each week, Chuang enrolled in a second GPS course and recently applied and was accepted into the Health and Medical Informatics program. Those vibrant discussions are at the heart of each GPS course. Chuang looks forward to the weekly feedback he receives from his instructor, which challenges him to engage even more deeply in peer-to-peer dialogue. Chuang decided to continue his education at Brandeis GPS because of the university’s dedication to academic excellence and high reputation in the greater Boston area. The fact that students have up to five years to complete their degree, and that Brandeis GPS gives Brandeis alumni a 15% tuition discount on online classes, also motivated him to enroll.